Courtesy graphic The 2011 Wagon Days poster features longtime Wagon Days participant Ivan Swaner, a lifelong resident of the Wood River Valley. Anyone who's been around town long enough has seen Ivan Swaner. He wears an impressive moustache and tells even more impressive stories from his early years in the Wood River Valley. 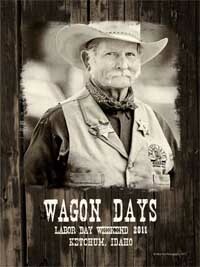 Raconteur, amateur historian and all-purpose man-about-town, Swaner is featured on the 2011 Wagon Days poster, the creation of Ketchum photographer Nina Fox. Swaner's image exemplifies the West, his story even more so. He went to elementary school in a one-room schoolhouse in rural Idaho. He remembers when "going south" meant riding out the winter in Twin Falls, rather than Mexico, and when skis were called "snowshoes" and used by ladies to get around town in the winter. Swaner became acquainted with Sun Valley Resort founder Averell Harriman at the Union Pacific Railroad commissary while working for the Sun Valley Co. as a young man, but his gnarled handshake is a testament to a life of hard work rather than socializing. "I've been everything I can think of, except a plumber and a waiter," he told the Mountain Express in 2005, the year he was named grand marshal of the Wagon Days Festival. His career included 14 years as Ivan the Terrible, the deputy marshal of Ketchum. "The Alpine (now Whiskey Jacques') had a red light on top of it, and when there was trouble, they would turn it on and we would go break up drunken fights or whatever it was," he said. For several years, Swaner served as caretaker of a ranch at Frenchman's Bend, out Warm Springs Road, until a house fire nearly killed him and destroyed all of his belongings four years ago. These days, Swaner works as camp host at Petitt Lake campground in the Sawtooth Valley, no doubt telling stories of historical interests to campers there. He can be seen having dinner most nights during summer at the Smiley Creek Restaurant. On Saturday, the Big Hitch parade will wind its way through Sun Valley and Ketchum beginning at 1 p.m. The parade boasts nearly 100 museum-quality wagons, hitches, buggies, carriages, stages and carts, and is the largest nonmotorized parade in the Northwest. After the parade (about 3 p.m.), poster artist Nina Fox will greet the public and be available to sign Wagon Days posters at Silver Creek Outfitters, on Main Street in Ketchum.